Michael Addition Reaction  is one of the most powerful methods in organic synthesis for C–C and C–X (X=O, N, S) bond formation (Fig. 1). Michael addition of imidazoles to α,β-unsaturated carbonyls/cyano compound represents a powerful synthetic approach in the area of synthetic heterocyclic chemistry and have attracted the attention of many chemist and biologists due to its applications in pharmaceutical research, agriculture science, and drug discovery. Fig. (1). Michael addition reaction. Imidazole ring is a constituent of several important natural products, including purine, histamine, histidine and nucleic acid. Being a polar and ionisable aromatic compound, it improves pharmacokinetic characteristics of lead molecules and thus used as a remedy to optimize solubility and bioavailability parameters of proposed poorly soluble lead molecules. The imidazole derivatives possess extensive spectrum of biological activities such as antibacterial, anticancer, antitubercular, antifungal, analgesic, and anti-HIV activities [2-8]. Some representative molecules of these structural motifs such as 1,2-Arylimidazole derivatives[I], Metronidazole[II], Complexes of Co(II) and Cu(II) with 3-(2-nitroimidazol-1-yl)propanoic acid[III], Tinidazole[IV] are shown in Fig. (2) [9-12]. Therefore, synthetic methodologies allowing rapid access to these heterocycles are highly desirable in organic synthesis and chemical biology/medicinal chemistry. Michael addition [13-24] is the most potent and economic method for the synthesis of β-amino carbonyl/cyano compound [25-29]. The conjugate addition of imidazole to α,β-unsaturated compounds for making β-amino carbonyl/cyano functionalities have been attracted target for synthetic chemistry . In this review we have sumerized various catalytic methods using Michael addition reaction for the synthesis of β-amino carbonyl/nitrile covering literature upto 2017. This review is systematized under the headings (1) Ionic liquid catalysed (2) Base catalyzed (3) Acid catalyzed (4) Enzyme catalysed (5). Fig. (2). Imidazole based bio active molecules. Michael type addition of N-substituted imidazoles 1 to α,β-unsaturated compounds 2 using Cu(acac)2 immobilized in ionic liquids([bmim]BF4 and [bmim]PF6) under ambient conditions has been reported by Kantam et al. in 2007. The conjugate addition of imidazole with acrylonitrile using Cu(acac)2 provided N-substituted imidazoles in poor yield whereas using Cu(acac)2 in ionic liquid, best yield of product obtained. The use of organic solvents such as toluene and chloroform were less effective in place of ionic liquids, whereas the use of a hydrophilic high polar solvent (such as Dimethyl Sulfoxide, DMSO) resulted in 80% product conversion in the same length of time. Both [bmim] [BF4] and [bmim][PF6] were equally effective as ionic liquids for the reaction.Temperature of the reaction also affected the yield of the reaction. Above or below 60 oC poor yield of product obtained. Different α, β-unsaturated compounds (such as acrylates, nitriles, and cyclic enones) underwent reaction with imidazole to give the corresponding addition products in good yields. Both simple acrylates and long-chain acrylates were equally effective for the conjugate additions with imidazole. Bulky esters such as tert-butyl acrylate afforded the product in good yield (Scheme. 1). Scheme (1). Michael addition of imidazoles to α,β-unsaturated compounds using copper(II) acetylacetonate immobilized in ionic liquids. A fast and green protocol for the Michael addition of N-heterocycles 4 to α, β -unsaturated carbonyl compounds 5, catalysed by a basic ionic liquid, 1-methyl-3-butylimidazolium hydroxide [bmIm]OH at room temperature in short reaction times (0.5–3 h) was developed by Lin et al. in 2007. A variety of structurally diverse imidazoles (4-nitro imidazole, 2-methyl-4-nitro-imidazole, 2-methyl imidazole, 4-methyl imidazoles) and α,β -unsaturated carbonyl compounds (ester, nitrile, ketone) underwent Michael additions smoothly without any other catalyst to generate the corresponding imidazole derivatives in moderate to good yields. Generally, the reactivity decreased with increasing chain length of acceptor. Vinyl acrylate showed higher reactivity than methyl acrylate. Michael acceptors like methyl methacrylate and methyl crotonate showed lower reactivity with 4-nitro imidazole because of the strong steric hindrance, whereas imidazole/substituted imidazoles underwent Michael addition with methyl acrylate favourably and all substituted imidazoles obtained in good yields in short reaction time. The reactivity was in accordance with the nucleophilicity of imidazole derivatives. Sterically hindered imidazole underwent Michael addition much more slowly. In this reaction no Markovnikov addition product was observed only Michael adduct was obtained because vinyl acrylate was used in excess in the reaction. This method is quite general and works with a broad range of N-heterocycles, including five-membered N-heterocycles, pyrimidines and purines. Also, in this reaction the recovered ionic liquid was reused for several cycles with consistent activity (Scheme 2). Scheme (2). Michael addition of Imidazole using basic ionic [bmIm]OH as catalyst. Scheme (3). Michael addition of imidazole to α,β-unsaturated substrates catalyzed by [Hmim]OTs. Xia et al. in 2012 reported the synthesis of various N-substituted carbonyl derivatives 9 by Michael addition of imidazole 7 to α, β-unsaturated ketone/nitro 8 catalysed by 1-methylimidazolium p-toluenesulfonic ([Hmim]OTs) 10 in good to excellent yield at 60◦C. The reactions did not work at room temperature. Michael addition reactions of various imidazole derivatives were performed using pent-3-en-2-one and (E)-(2-nitrovinyl)benzene as electrophiles. Quantitative yield of product (92-95%) was obtained when tetrazole/triazole was reacted with pent-3-en-2-one in 1-3h whereas moderate yield (65-79%) of product was obtained with imidazole/diazole in 12-24h. Better yield of the product was obtained when pent-3-en-2-one was used as electophile in comparision to (E)-(2-nitrovinyl)benzene (yield 82%). No product formation was observed when the reaction was carried out using other α,β-unsaturated electrophiles such as methyl acrylate, acrylamide, acrylonitrile and (E)-(2-nitrovinyl)benzene using ethyl carbamate or 1H-benzo [1-3] triazole as the acceptor respectively (Scheme 3). Scheme (4). Michael addition of Imidazole and its derivatives to acrylate and methyl vinyl ketone. In 2007 Lin et al. developed aza-Michael reaction imidazole 11 to α,β-unsaturated compounds 12 using N-methyl imidazole as catalyst. The reaction proceeds in a highly efficient and rapid manner with high yield by mixing 4-nitroimidazole and methyl acrylate with N-methylimidazole in dimethyl sulfoxide at 70 °C for 1 h (Scheme 4). In the absence of catalyst reaction was gone but very poor yield was observed. 4-nitroimidazole gave superior results, compared with imidazole in the reaction with methyl acrylate. Presence of electron-withdrawing groups enhanced the nucleophilicity and reactivity of the N-heterocycles. Triazole was found to be more reactive than imidazole, 2-methylimidazole and 4-methylimidazole, both in the aza-Michael addition to methyl vinyl ketone and to methyl acrylate. Also the reaction was studied with a range of acrylates revealed that the chain length of the ester played a minimal role in governing the reactivity of the conjugate addition. As the carbon chain of the alcohol moiety was increased in length, a slight decrease in yield was observed. In case of michael acceptors either α-methyl or β-methyl substituted acrylates reaction proceeded more slowly due to steric hindrance. Compared with 4-nitroimidazole, 2-methyl-4-nitroimidazole gave slightly lower yields upon reaction with both methyl vinyl ketone and methyl acrylate due to the substitution at the 2-position. Michael-type addition of azoles, inter aliaimidazole and 1,2,4-triazole derivatives of high acidity (pKa ≤6.05), to methyl acrylate 15 was carried out regioselectively by Boncel et al. in 2011. The optimisation process involved the use of an appropriate basic catalyst (DBU, DIPEA, NaOH, NaH, TEDA), a donor/base/acceptor ratio. The reactions were carried out in DMF. The adducts formed were used as biologically active intermediates (Scheme 5). Scheme (5). Michael-type addition of imidazole with methyl acrylate under basic conditions. Scheme (6). The reactions of vinyl ketone with imidazole. Luo et al. has developed an aza-Michael addition–protonation reactions using 19, TfOH as the catalyst. Michael addition of imidazole 7 to α-branched vinyl ketone 17 provided Michael adduct with good yield without enatioselectivity (Scheme 6). V. Calvino-Casilda et al. in 2011 reported the in situ raman monitoring durning Michael addition reaction of imidazole 7 and ethyl acrylate 20 at moderate reaction temperatures in dry media using basic carbon as catalyst to produce N-substituted imidazoles 21 with 100% selectivity. This non-invasive methodology provides molecular information on the reaction mechanism and possible species as intermediates of the reaction (Scheme 7). Scheme (7). Michael addition of imidazole and ethyl acrylate catalysed by basic carbon. Banik et al. in 2003  developed Michael addition reaction of imidazole 7 with acyclic/cyclic enones 22 catalyzed by bismuth nitrate. This method was very general, simple, high yielding, environmentally friendly and oxygen tolerant (Scheme 8). Scheme (8). Michael addition of imidazole catalyzed by bismuth nitrate. Xia and his group  introduced first hetero Michael addition reactions of imidazole 7 to α,β-unsaturated ester 20 catalyzed by KF/Al2O3 in acetonitrile 18h stirring provided Michael adduct 21 in 96% yield. In contrast with the existing methods using much acid catalyst, this method was very general, simple, high-yielding and environmentally friendly. This catalytic system was also exhibited efficient catalytic activity in the hetero-Michael addition reaction of α,β-unsaturated compounds with other nitrogen, oxygen, and sulphur nucleophiles (Scheme 9). Scheme (9). KF/Al2O3catalysed hetero-Michael addition of ethyl acrylate with imidazole. Uxue Uria et al. in 2007 reported the asymmetric organocatalytic aza-Michael addition reaction of substituted imidazole 25 with α,β-unsaturated aldehydes 24 using imidazole based chiral catalyst 27 and TFA in ethyl nitrile at low temperature. When R = CN best yield was obtained with 31% ee whereas when R = H the yield of the product was negligible (Scheme 10). Scheme (10). Aza Michael addition of imidazole catalysed TFA. Guo et al. in 2009  reported the silica supported sulphuric acid catalysed aza-Michael addition reaction of imidazole 7 to acrylic acid 2-phenylsulfanyl-ethyl ester (PTEA) 27 in solvent free condition. The disadvantage associated with the reaction was more time and lower yield of product which might be due to the weak nucleophilicity of the imidazole molecule steming from its aromaticity (Scheme 11). Scheme (11). Michael addition of amines catalysed by SSA under solvent-free conditions. Scheme (12). CeCl3·7H2O-NaI-SiO2catalysed Michael reaction of enones with imidazole/purine. Lee et al. 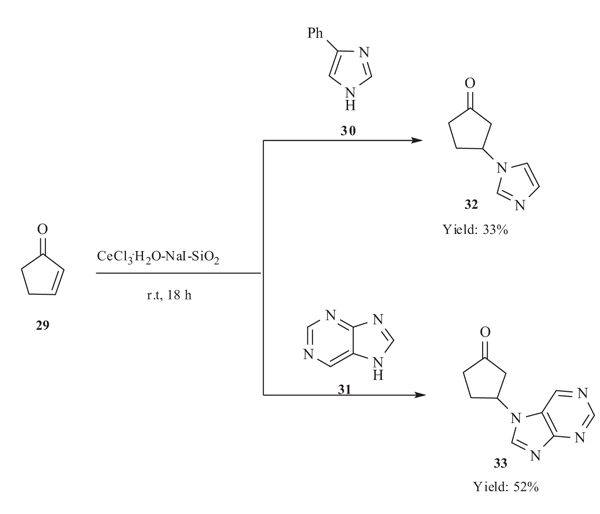 in 2012 developed an efficient one-pot protocol for Michael addition of imidazole/purine 30/31 to enones 29 catalysed by CeCl3·7H2O-NaI-SiO2 at room temperature. The reaction took long time as well as the yield of the product was very poor (Scheme 12). Martin-Aranda et al. 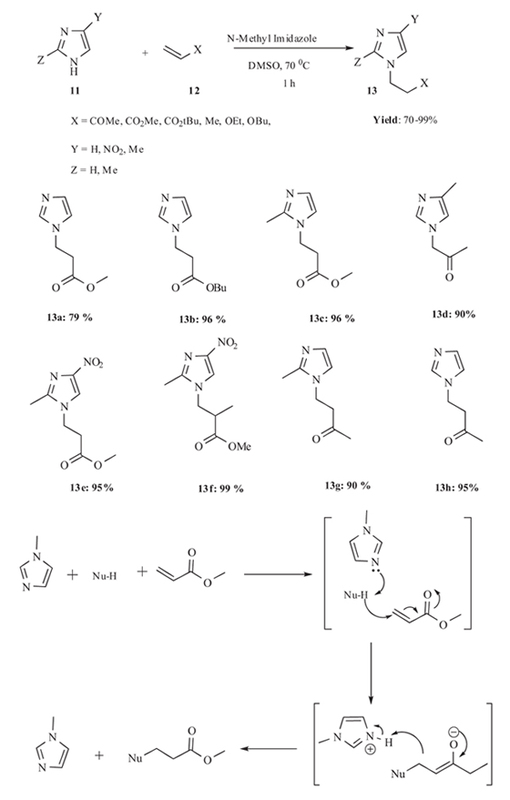 in 2002 took the advantage of sonication reaction and developed a novel methodology for the synthesis of N-substituted imidazole derivatives 21 by the Michael addition of imidazole 7 to ethylacrylate 20 catalysed by basic clays (Li+ and Cs+ montmorillonites). Alkaline clays are active and very selective catalyst under sonication and employs positive effect for Michael addition of imidazole to ethyl acrylate also enhances the formation of N-substituted imidazole derivatives in comparision to other conventional thermal heating reactions. The conversion increases with the basicity of clays and ultrasonic exposition time. The yield was maximum when Cs+ montmorillonites was used in comparision to Li+ which might be due to higher basicity. (Scheme 13). Scheme (13). Michael addition Imidazole to ethyl acrylate. 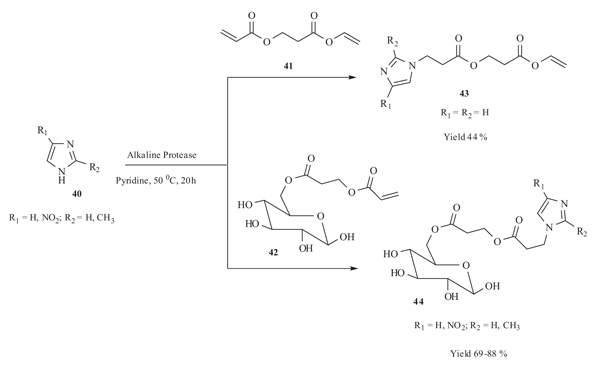 Catalytic Activity of alkaline protease for Michael addition reaction of imidazole 34 to α,β-unsaturated acrylate 35 in pyridine at 50 oC for 72h was studied by Lin et al. in 2004. The reaction proceeded well and provided the N-substituted imidazole derivative 36 up to a satisfactory yield (62-76%). Catalyst plays a significant role for the progress of the reaction. When the enzyme was changed to lipase the yield of the product decreases to 10-25%. Structure of Michael donor as well as acceptor also affect the yield of the reaction. With increasing the chain length of Michael acceptor the yield of the reaction decreased (Scheme 14). Scheme (14). Michael addition of substituted Imidazole with acrylates, catalysed by alkaline protease. Cai et al. in 2006  described Michael addition reaction of imidazole derivatives 37 to acrylic monomers 38 in organic medium. 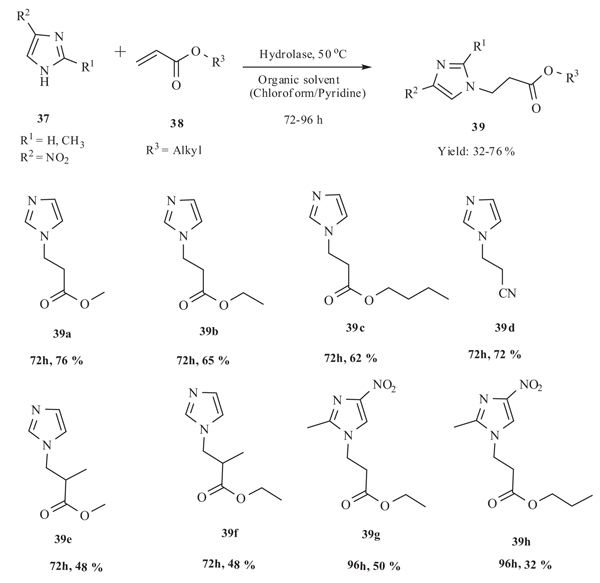 A serial of N-substituted imidazole derivatives 39 were successfully synthesized in moderate yields (32-76%) by the catalysis of hydrolases in organic medium. Non-polar solvents was more favorable to the hydrolase-catalyzed Michael addition reaction than polar solvents. Solvents with higher log P value gave higher yield of product. The acceptor with shorter alcohol chain afforded a higher yield. More rapid conversion was observed when the donor had an electron-withdrawing group whereas presence of elctron donating groups decreases the yield of the reaction to 28-31% (Scheme 15). Scheme (15). Michael addition of imidazoles and acrylic monomers catalyzed by alkaline protease from Bacillus subtilis at 50 oC. Scheme (16). Michael addition of imidazole with unsaturated ester. Lin and co-workers disclosed  a regioselective one-pot synthesis of N-substituted imidazole derivatives 43 and 44 by Michael addition reaction of imidazole 40 to sugar conjugated α,β-unsaturated ester 42/2-vinyloxycarbonyl-ethyl ester 41 catalysed by alkaline protease from bacillus subtilis in anhydrous pyridine. The imidazole-sugar conjugates derivatives 44 were obtained in good yield (69-80%) in comparision to imidazole ethyl ester 43 (yield 44%) (Scheme 16). 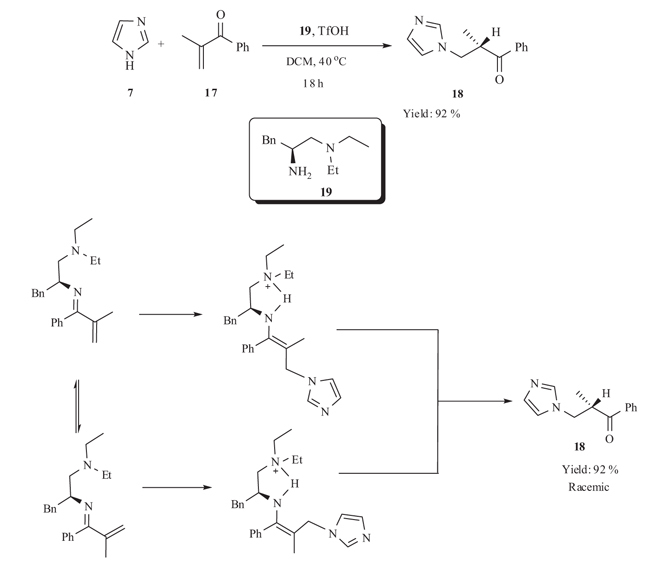 Ballesteros and his research group in 2006  reported an easy and efficient synthetic approach for the synthesis of N-substiuted imidazole derivatives 47 by the Michael addition reaction of imidazole 45 to α,β-unsaturated ester 46 in DMF at 100 °C in moderate yield (Scheme 17). Scheme (17). Efficient synthesis of the first (Nitro imidazoyl) Succinic ester. Scheme (18). Polystyrene-supported CuI–imidazole complex for the aza Michael reactions. Xing et al. in 2012  reported PS–imCuI catalyst 49 (polystyrene-supported CuI–imidazole complex) supported aza-Michael addition reaction of imidazole 7 to α,β-unsaturated nitrile 48 with good yields in 4-8 h. The catalyst had significant role for the progress of the reaction. No product formation was observed in the absence of catalyst in DMF. Very low amount of product formation was observed when homogeneous CuI was used instead of PS-imCuI catalyst. Temperature had a great role on the yield of the reaction. Higher reaction temperature resulted better yields. With the increase of the catalyst dosage, the yields increase quickly whereas the increase slows down when the catalyst usage was over. Best yield of product formation was observed with acrylonitrile whereas yield was poor with methyl methacrylate which might be due to the electronegativity of cyano group is bigger than that of ester group in DMF so that the reaction of imidazole with acrylonitrile is easier than with acrylate. Imidazole with electron donating methyl was also less active than simple imidazole which could be due to the stieric hindrance of the 2-methyl imidazole (Scheme 18). After intense investigations in the last decade, impressive advances in organocatalytic aza-Michael reactions have been achieved in every branch of organocatalysis (proline, hiourea, cinchona, and phosphoric acid catalysis), providing a simple, direct, and highly stereoselective way to access both cyclic and acyclic, chiral, nitrogen-containing compounds under mild reaction conditions. Especially, cascade processes show the specific advantage in efficiently constructing complex nitrogen-containing heterocycles in one single operation. Furthermore, the aza-Michael addition has been successfully applied in total synthesis of biologically active natural products. Further findings and contributions in this attractive field are expected to extend the scope of nitrogen nucleophiles and Michael acceptors and to design new domino processes as well as to explore the total syntheses of complex molecules using aza-Michael reactions as a key step After intense investigations in the last decade, impressive advances in organocatalytic aza-Michael reactions have been achieved in every branch of organocatalysis (proline,thiourea, cinchona, and phosphoric acid catalysis), providing a simple, direct, and highly stereoselective way to access both cyclic and acyclic, chiral, nitrogen-containing compounds under mild reaction conditions. Especially, cascade processes show the specific advantage in efficiently constructing complex nitrogen-containing heterocycles in one single operation. Furthermore, the aza-Michael addition has been successfully applied in total synthesis of biologically active natural products. Further findings and contributions in this attractive field are expected to extend the scope of nitrogen nucleophiles and Michael acceptors and to design new domino processes as well as to explore the total syntheses of complex molecules using aza-Michael reactions as a key step. After intense literature investigations on last ten years, impressive advances in aza-Michael reactions of imidazole to α,β-unsaturated carbonyls/cyano compound have been achieved which provided a simple, direct way to access nitrogen containing heterocycles under mild conditions. Especially, the present reports show the specific advantage in efficient construction of imidazole containing nitrogen heterocycles in one single operation which can further be used as potential candidate for the synthesis of valuable synthetic intermediates of natural as well as unnatural products. SRM thank CSIR (Ref. 02(0218)/14/EMR-II), UGC start-up grant [Ref. 30-127/2015(BSR)], DST Fast track grant (Ref. SB/FT/CS-087/2012), DRDO New Delhi (Ref. ERIP/ER/1203083/M/01) for their financial support. Perlmutter P. Conjugate Addition Reactions in Organic Synthesis 1992. Cardillo G, Tomasini C. Asymmetric synthesis of ß-amino acids and α-substituted β-amino acids. Chem Soc Rev 1996; 25: 117-28. Juaristi E, López-Ruiz H. Recent advances in the enantioselective synthesis of β-amino acids. Curr Med Chem 1999; 6(10): 983-1004. Seebach D, Matthews JL. β-Peptides: A surprise at every turn. Chem Commun (Camb) 1997; 2015-22. Juaristi E. Enantioselective synthesis of α-amino acids 1997. Sewald N. Stereoselective synthesis ofβ-amino acids via conjugate addition of nitrogen nucleophiles to α,β-unsaturated esters - Recent advances. Amino Acids 1996; 11(3-4): 397-408. Devine PN, Heid RM Jr, Tschaen DM. Stereoselective synthesis of 2-aryloxy esters: An asymmetric approach to fluoxetine, tomoxetine and nisoxetine. Tetrahedron 1997; 53: 6739-46. Li W, Li X, Wu W, Liang X, Ye J. Highly diastereo- and enantioselective one-pot Michael-Aldol reactions of α,β-unsaturated aldehydes with imidazole derivatives. Chem Commun (Camb) 2011; 47(29): 8325-7. Desiraju GR, Gopalakrishnan B, Jetti RKR, et al. Computer-aided design of selective COX-2 inhibitors: comparative molecular field analysis, comparative molecular similarity indices analysis, and docking studies of some 1,2-diarylimidazole derivatives. J Med Chem 2002; 45(22): 4847-57. Katritzky AR, Rees CW. Comprehensive Heterocyclic Chemistry 1984; 5: 469-98. Goodgame DML, Page CJ, Williams DJ. Metal complexes as radiosensitizers: Cobalt(II), Copper(II), Rhodium(II) and Platinum(II) complexes of 3-(1-imidazoyl)propionic acid and some nitrosubstituted derivatives, and the crystal structure and radiosensitizer activity of [CuL2(H2O)]2.2H2O, Where LH = 3-[1-(4-Nitroimidazoyl)]Propionic acid. Polyhedron 1992; 11: 2507-15. Mital A. 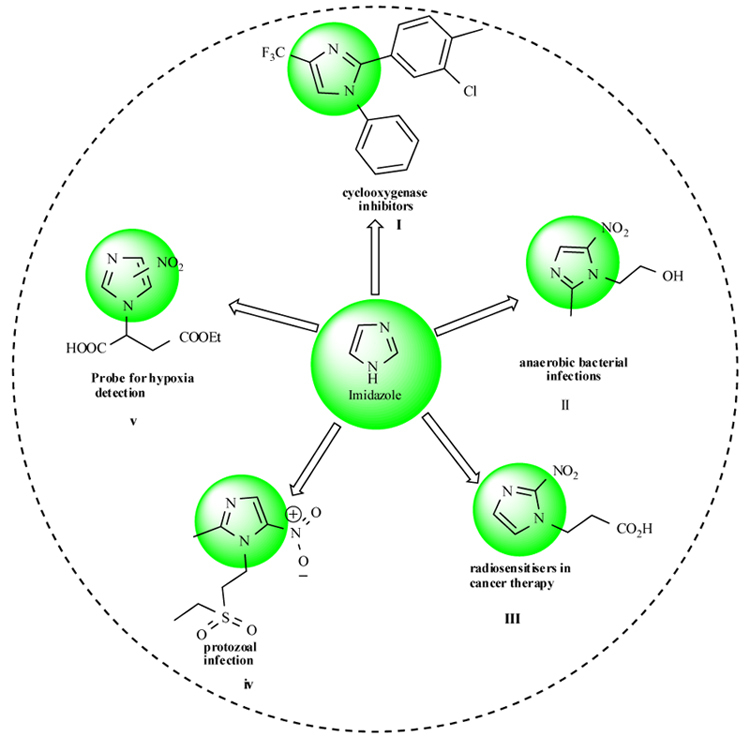 Synthetic nitroimidazoles: Biological activities and mutagenicity relationships. Sci Pharm 2009; 77: 497-520. Bhanja C, Jena S, Nayak S, Mohapatra S. Organocatalytic tandem Michael addition reactions: A powerful access to the enantioselective synthesis of functionalized chromenes, thiochromenes and 1,2-dihydroquinolines. Beilstein J Org Chem 2012; 8: 1668-94. 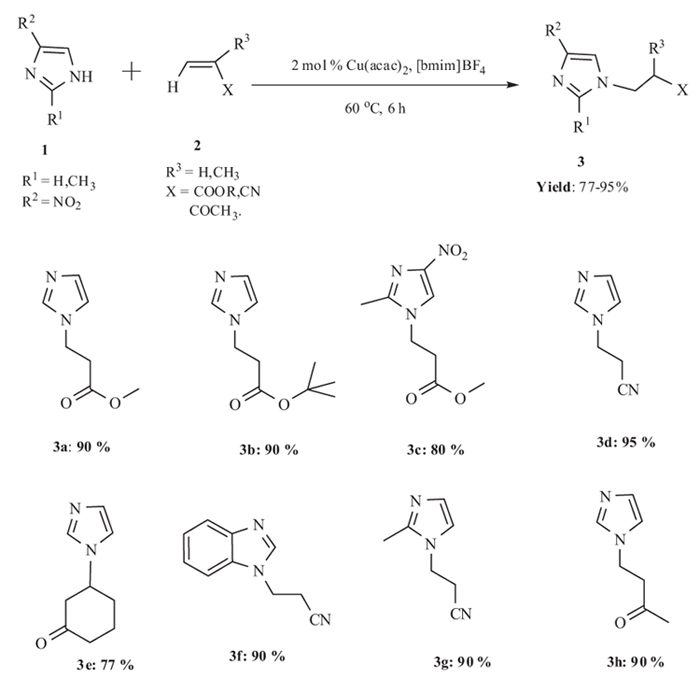 Mohapatra S, Bhakta S, Chakroborty S, Tripathy M, Nayak S. One-pot Michael addition-oxidation reaction for the synthesis of coumarin–chromene hybrid compounds from 4-hydroxycoumarin and 3-nitro-2-phenyl-2H-chromene. Res Chem Intermed 2015; 41: 7799-813. Nayak S, Panda P, Bhakta S, Mishra SK, Mohapatra S. Current advances of organocatalytic Michael–Michael cascade reaction in the synthesis of highly functionalized cyclic molecules. RSC Advances 2016; 6: 96154-75. Gandelman M, Jacobsen EN. Highly enantioselective catalytic conjugate addition of N-heterocycles to α,β-unsaturated ketones and imides. Angew Chem Int Ed Engl 2005; 44(16): 2393-7. Dinér P, Nielsen M, Marigo M, Jørgensen KA. Enantioselective organocatalytic conjugate addition of N heterocycles to α,β-unsaturated aldehydes. Angew Chem Int Ed Engl 2007; 46(12): 1983-7. Uria U, Reyes E, Vicario JL, Badía D, Carrillo L. 5-Mercapto-tetrazoles as synthetic equivalents of nitrogen-contaning functional groups. the case of the organocatalytic enantioselective aza-michael reaction. Org Lett 2011; 13: 336-9. Lin Q, Meloni D, Pan Y, et al. Enantioselective synthesis of Janus Kinase Inhibitor INCB018424 via an organocatalytic aza-Michael reaction Org Lett 2009; 11: 1999-2002. Wang J, Li H, Zu L, Wang W. Enantioselective organocatalytic Michael addition reactions between N-heterocycles and nitroolefins. Org Lett 2006; 8(7): 1391-4. Wang J, Zu L, Li H, Xie H, Wang W. Cinchona alkaloid based thiourea promoted enantioselective conjugate addition of N-heterocycles to enones. Synthesis 2007; 16: 2576-80. Luo GS, Zhang SL, Duan WH, Wang W. Enantioselective conjugate addition of N-heterocycles to α,β-unsaturated ketones catalyzed by chiral primary amines. Synthesis 2009; 9: 1564-72. Lv J, Wu H, Wang YM. Organocatalytic enantioselective aza-Michael additions of N-heterocycles to α,β-unsaturated enones. Eur J Org Chem 2010; 11: 2073-83. Guo H-M, Yuan T-F, Niu H-Y, et al. Highly enantioselective synthesis of designed chiral acyclonucleosides and acyclonucleotides by organocatalytic aza-Michael addition. Chemistry 2011; 17(15): 4095-8. Hou X, Hemit H, Yong J, Nie L, Aisa HA. Mild and efficient procedure for Michael addition of N-heterocycles to α,β-unsaturated compounds using anhydrous K3PO4 as catalyst. Synth Commun 2010; 40: 973-9. Enders D, Wang C, Liebich JX. Organocatalytic asymmetric aza-Michael additions. Chemistry 2009; 15(42): 11058-76. Lin Q, Meloni D, Pan Y, et al. Enantioselective synthesis of Janus kinase inhibitor INCB018424 via an organocatalytic aza-Michael reaction. Org Lett 2009; 11(9): 1999-2002. 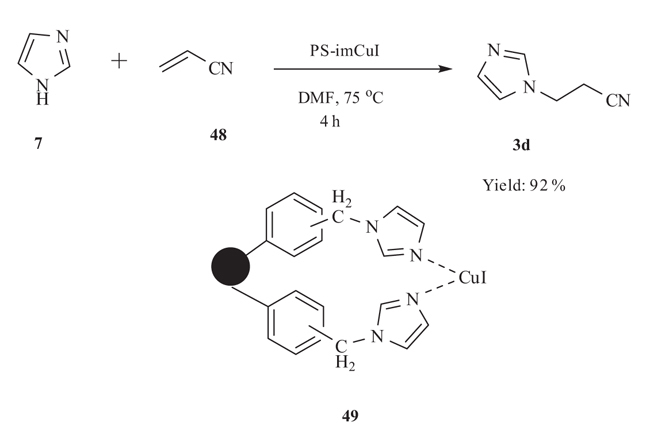 Kantam LM, Neelima B, Reddy CV, Chakravarti R. Aza-Michael addition of imidazoles to α,β-unsaturated compounds and synthesis of β-amino alcohols via nucleophilic ring opening of epoxides using copper(II) acetylacetonate (Cu(acac)2) immobilized in ionic liquids. Ind Eng Chem Res 2007; 46: 8614-9. Xu J-M, Qian C, Liu B-K, Wu Q, Lin XF. A fast and highly efficient protocol for Michael addition of N-heterocycles to α,β-unsaturated compound using basic ionic liquid [bmIm]OH as catalyst and green solvent. Tetrahedron 2007; 63: 986-90. Han F, Yang L, Li Z, Xia C. Acidic-functionalized ionic liquid as an efficient, green and reusable catalyst for hetero-Michael addition of nitrogen, sulfur and oxygen nucleophiles to α,β-unsaturated ketones. Org Biomol Chem 2012; 10(2): 346-54. Liu BK, Wu Q, Qian XQ, Lv DS, Lin XF. 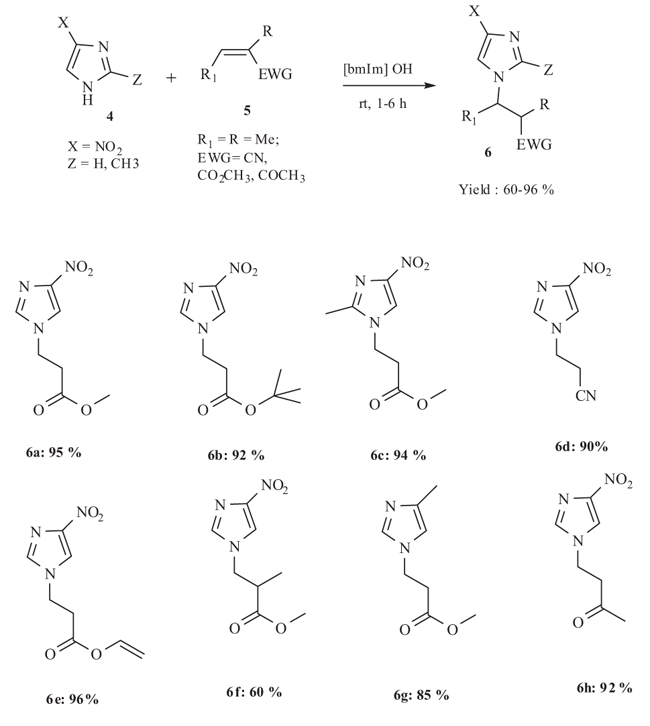 N-methylimidazole as a promising catalyst for the aza-Michael addition reaction of N-heterocycles. Synthesis 2007; 17: 2653-9. Boncel S, Saletra K, Hefczyc B, Walczak KZ. Michael-type addition of azoles of broad-scale acidity to methyl acrylate. Beilstein J Org Chem 2011; 7: 173-8. Fu N, Zhang L, Luo S, Chenga J-P. Chiral primary amine catalysed asymmetric conjugate addition of azoles to α-substituted vinyl ketones. Org Chem Front 2014; 1: 68-72. Calvino-Casilda V, Ba˜nares MA. In situ Raman monitoring of Michael addition for the synthesis of 1-substituted imidazoles intermediates with antiviral properties. Catal Today 2012; 187: 191-4. Srivastava N, Banik BK. Bismuth nitrate-catalyzed versatile Michael reactions. J Org Chem 2003; 68(6): 2109-14. Yang L, Xu L-W, Xia C-G. Highly efficient KF/Al2O3-catalyzed versatile hetero-Michael addition of nitrogen, oxygen, and sulfur nucleophiles to α, β-ethylenic compounds. Tetrahedron Lett 2005; 46: 3279-82. Uria U, Vicario JL, Badía D, Carrillo L. Organocatalytic enantioselective aza-Michael reaction of nitrogen heterocycles and α,β-unsaturated aldehydes. Chem Commun Camb 2007; 24: 2509-11. Wang Y, Yuan Y-Q, Guo SR. Silica sulfuric acid promotes aza-Michael addition reactions under solvent-free condition as a heterogeneous and reusable catalyst. Molecules 2009; 14(11): 4779-89. Lee IYC, Lee KC, Lee HW. CeCl3·7H2O-NaI-SiO2 catalyzed aza-Michael addition of N-Heterocycles to enones under solvent free conditions. Bull Korean Chem Soc 2012; 33: 3535-6. Martin-aranda RM, Oretega-cantero E, Rojas-cervantes MI, Vicente-Rodriguez MA, Banares-Munoz MA. Sonocatalysis and basic clays. Michael addition between imidazole and ethyl acrylate. Catal Lett 2002; 84: 201-4. Cai Y, Yao SP, Wu Q, Lin XF. Michael addition of imidazole with acrylates catalyzed by alkaline protease from Bacillus subtilis in organic media. Biotechnol Lett 2004; 26(6): 525-8. Cai Y, Wu Q, Xiao YM, Lv DS, Lin XF. Hydrolase-catalyzed Michael addition of imidazoles to acrylic monomers in organic medium. J Biotechnol 2006; 121(3): 330-7. Yao S-P, Lu D-S, Wu Q, Cai Y, Xu S-H, Lin X-F. A single-enzyme, two-step, one-pot synthesis of N-substituted imidazole derivatives containing a glucose branch via combined acylation/Michael addition reaction. Chem Commun (Camb) 2004; 17: 2006-7. Pacheco-Torres J, Perez-mayoral E, Sorian E, et al. A convenient and efficient synthesis of the first (nitroimidazolyl) succinic esters and their diacids. Synthesis 2006; 3859-64. Li L, Liu Z, Ling Q, Xing X. Polystyrene-supported CuI–imidazole complex catalyst for aza-Michael reactionof imidazoles with α,β-unsaturated compounds. J Mol Catal Chem 2012; 353-354: 178-84.